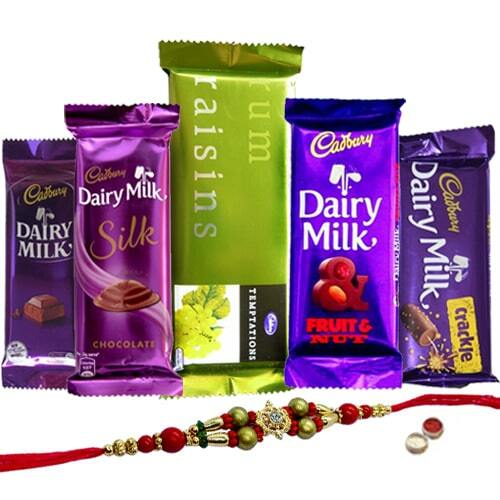 On this sacred Raksha Bandhan, savour the sweet relation you share with your dear ones by sending them this Delicious Cadburys Chocolate Set combined with your love along with a free Rakhi, Roli Tilak and Chawal. This set arrives with Temptation, Cadbury Dairy Milk Crackle, Cadbury Dairy Milk Silk, Cadbury Dairy Milk Fruits Nuts and Cadbury Dairy Milk. A slight variation in design may take place.